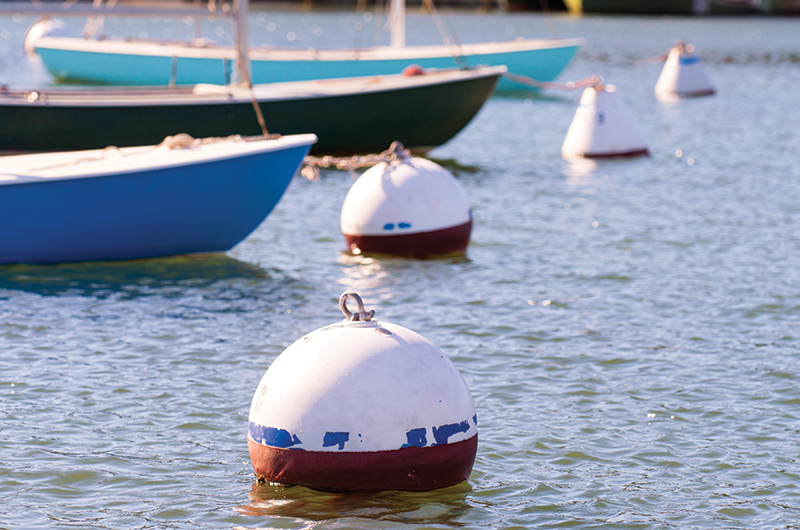 A mooring in one of the Island’s protected harbors is a convenience for small boat owners, allowing them to avoid the Vineyard’s few public ramps, where boaters of varying trailering skills launch boats and, on occasion, their vehicle and the boat together. Further up the boat food chain, a mooring is a necessity for the owners of boats with utility-wire-snagging masts and T-tops. But finding a mooring, as more than a few would-be Island Ahabs have discovered, is much more difficult to come by than a boat. Anyone will sell you a boat, after all; some will even give you a boat. But it requires plenty of patience to reel in a concrete block on the bottom of one of the coveted harbor locations. It also helps to have a certain amount of morbid luck – those ahead of you on the wait list must die before you do. (And even then they can pass the mooring on to their immediate family. Some moorings have been in the same family for more than seventy years.) There are stories, true stories, of parents adding the names of newborn children to a town mooring list. And why not, when the wait for a prime spot can encompass a time span from birth to college graduation – with a master’s. “The inner harbor list is about twenty-five years long,” Charlie Blair, longtime Edgartown harbor master, said. Crocker said he fields constant requests from people who say they have just bought a boat and need a mooring. And then there is Ted Box. Since 2011, Crocker and the Island watched as Box built the seventy-foot wooden scow The Seeker on a vacant lot off Beach Road in Vineyard Haven owned by Ernie Boch. Up against a deadline, he moved the boatbuilding project to a lot down the road owned by Ralph Packer, owner of R.M. Packer Co., and a supporter of Box’s dream project. Finally, well behind schedule, after seven years and with much fanfare and some anxiety, last year on July 14 The Seeker slid into Vineyard Haven Harbor. The Seeker was moved to a mooring Packer owns in Tashmoo.